TheInternationalConferenceonWired/WirelessInternetCommunications(WWIC)was held for the second time, following a successful start in 2002, in LasVegas. The goal of theconferencewastopresenthigh-qualityresultsinthe?eld,andtoprovideaframework for research collaboration through focused discussions that designated future research efforts and directions. 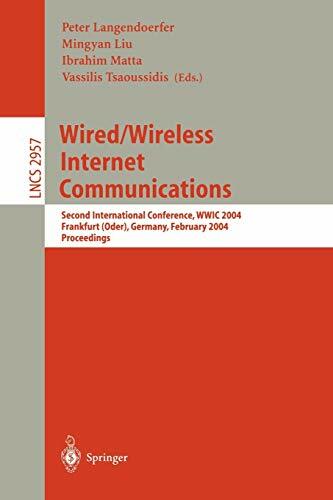 The number and the quality of submissions indicate that we are well on the way to establishing WWIC as a major event in the ?eld of wired/wireless internet communications. We received around 60 competitive submissions from Europe, North America, the Middle East and the Far East. Each submission was reviewed by at least two experts, although the majority received three or more reviews. Based on this rigorous reviewing procedure, the International Program Committee selected 26 submissions for presen- tion and publication in the proceedings. Therefore, we should all expect the quality of a selective conference in this volume. We hope you will enjoy it. The papers selected for presentation at WWIC 2004 were stimulating and of utmost interest. They were organized into eight sessions: 1. Protocol engineering and energy ef?ciency in wireless networks 2. Mobility management and mobile devices 3. Transport layer and congestion control 4. Architecture, implementation and experimentation 5. Network and protocol modeling 6. Wireless network scheduling and analysis 7. Multimedia distribution and group communication 8. Service discovery. We would like to thank the authors for choosingWWIC 2004 to submit their results. We would also like to thank all the members of the Technical Program Committee, as well as the additional reviewers, for their effort to provide detailed and constructive reviews.